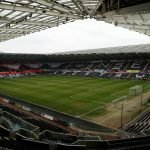 An hour before kick-off provides us all with a game of “guess the formation”, the team line-ups are announced and Swansea City manager Graham Potter’s selections leave us all scratching our heads as to who’s playing where and in what formation. Many teams and managers would have established their strongest eleven and system by now with tweaks here and there to cope with injuries and the busy schedule but Potter is not afraid whatsoever to make 5, 6 or even 7 personnel changes as well as a change of formation game by game. After ten games, Potter has already started off with a 4-3-3, moved to a 4-2-3-1 briefly, a flat 4-4-2 and more recently a 4-2-2-2 double six in recent games – so you can see why today was no different and had us all wondering how we were going to shape up against QPR. To break it down today and to demonstrate exactly how well Potter is pulling these changes off, today he fielded only one fullback (Connor Roberts), 4 midfielders and 2 strikers. A back three then perhaps? No. A 4-4-2 then if we started two strikers? No, wrong again. Ok, Celina – he’s a number 10 playing behind a striker? No. And then, where would that leave the other striker? Late to the game, interesting line-up – who's playing where? Now, with all these variations and the confusion as to who’s playing where you can imagine how the opposition must react and attempt to deal with matching them up. Against Stoke, their manager Gary Rowett admitted after the game that our “good rotations” and players not “sticking to rigid positions” made it difficult for them. So what was our formation today? 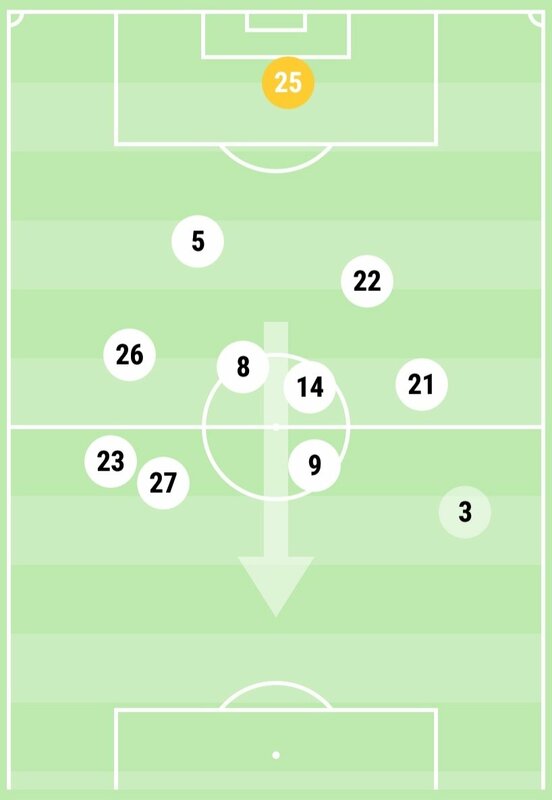 Initially, I thought it was a 4-1-4-1 – that’s what our early average shape suggested with Tom Carroll sitting deeper behind a flat four and Baker-Richardson helping to stretch the game up top. The team shape below left is the overall team shape without the subs, the subs are included in the image below right. The main observations here are the full-backs both playing more inside rather than high and wide. 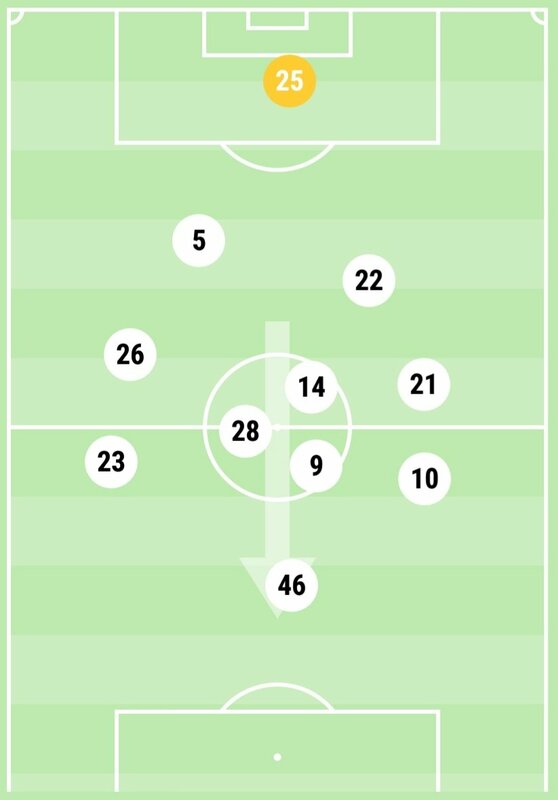 Secondly, Carroll (14) pushed up further alongside Byers (28) and it was McBurnie (9) rather than the returning Celina (10) playing as a number 10 behind Baker-Richardson (46) up front. There’s a great balance to that overall team shape above (above left). 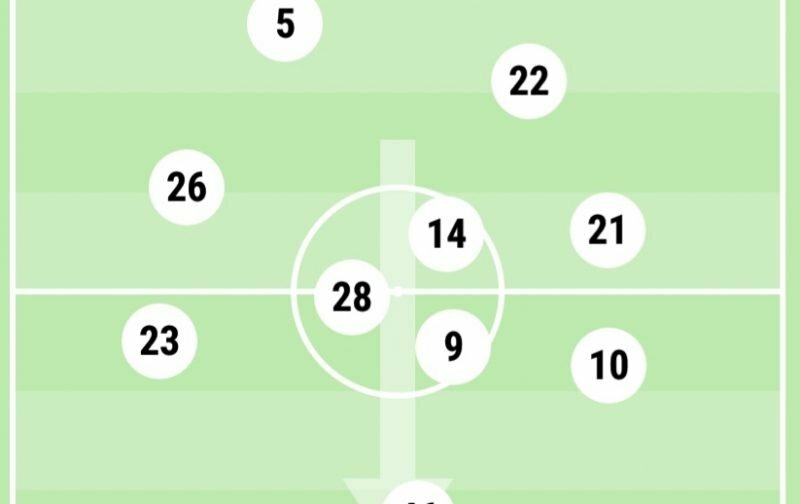 Three central play-makers in the middle – Carroll, Byers and McBurnie and the rest operating around them. Potter seemed happy to go conservative with his substitutions when his side were 1-0 up judging from the second image above. Baker-Richardson and Byers made way for Fer and Fulton. Fer slotted in alongside Carroll in a holding role in front of the centre backs. Fulton contributed with a goal and an assist and Olsson came on later down the left. “The problem with that is that we are not left with too much depth stretching the centre-backs. Totally agree. It was fascinating to watch Roberts and Naughton switch roles so often: Connor seemed to have carte blanche to move into the middle, and, when that happened, there was Kyle popping up on the touchline.